Successfully Added Head Mounted Sports Action Camera "ActionCam" - 2.5 Inch LCD Screen to your Shopping Cart. This head mounted sports action camera is the best way to capture and relive your exhilarating moments! Mounts on Anything: Although this action sports camcorder is designed to be worn over your ear, it also includes every attachment you will need to mount and stabilize this sports action camera on anywhere you want! With many different options available, you will never have a problem finding the perfect location to securely attach this sports action video Camera. What’s more, with a remote control you can be sure that you will capture the exact moments you desire! Great for Any Sport: Extreme sports demand extreme durability. Ruggedly built, you can safely take this camera everywhere you go and never have to worry about harsh weather conditions or mild impacts again. While is specially designed for extreme sports, it’s also excellent for hunting, paintball, or even military, police and security use. 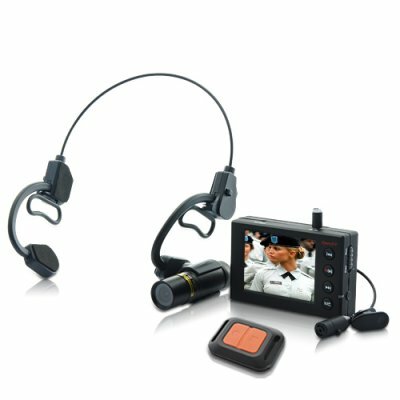 Great Performance: Along with 720x576 color video recording at VGA quality (30 frames per second) and fully integrated microphone, this baby gets the job done. Even better, the 2.5 inch LCD screen lets you see what you're recording in real-time, as well as immediately review everything you've just recorded. This Sports Action Camera is in stock and available for immediate shipment. Purchase your bulk orders today before they sell out, or buy a single piece to test this awesome product yourself. Brought to you by your source of professional sports cameras, Chinavasion. Will this video recorder pick up sound too? Yes! There is a built-in microphone near the camera which will pick up everything you have to say.